What was your Alibi tonight? As you can probably tell by now, Vancouver is pretty spoilt for choice when it comes to beer and also cool places to drink. The Alibi Room was one of the bars I would say belongs on everybody’s ‘must do’ list if they are planning a trip. 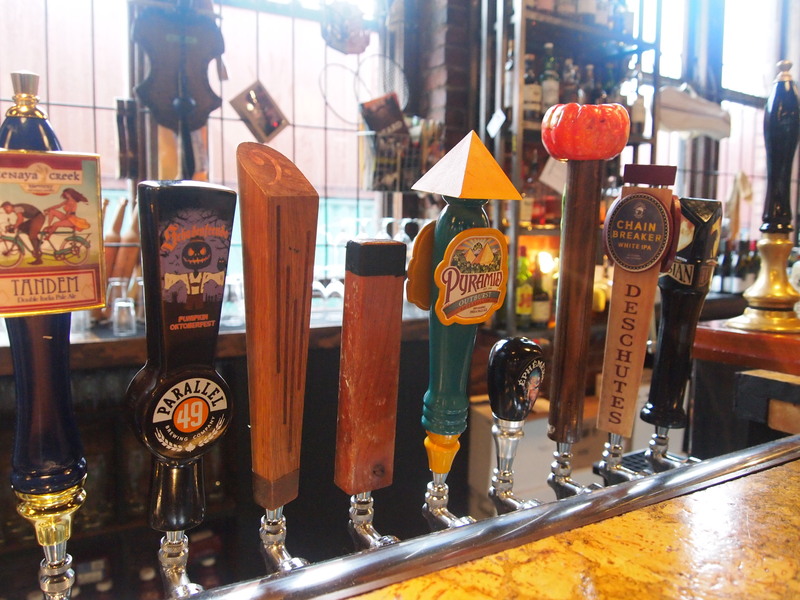 The bar is adorned with 50, yes 50, taps of local and imported beer! It’s so pretty – the taps aren’t the generic uniform taps we are used to in the UK with a pump-clip on the front. Each brewery seems to have its own tap handle design and some even have a special handle for individual beers.They’re like quirky little works of art! 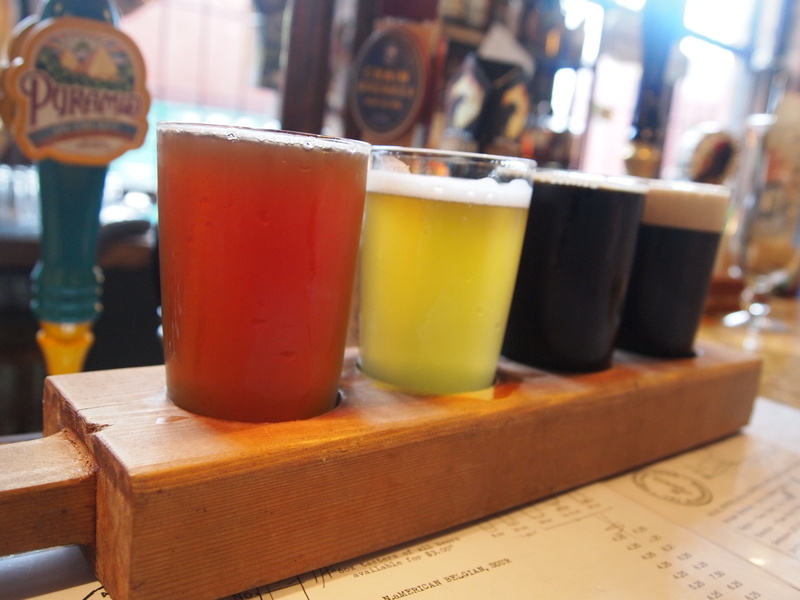 Thankfully, the bar made it easy to try many beers at once by offering ‘flights’ which are four small glasses slotted into a wooden paddle. took a sip. I really am trying to learn to love sour and the OH said I should toughen up if I want to come to Brussels with him to try the ones there. 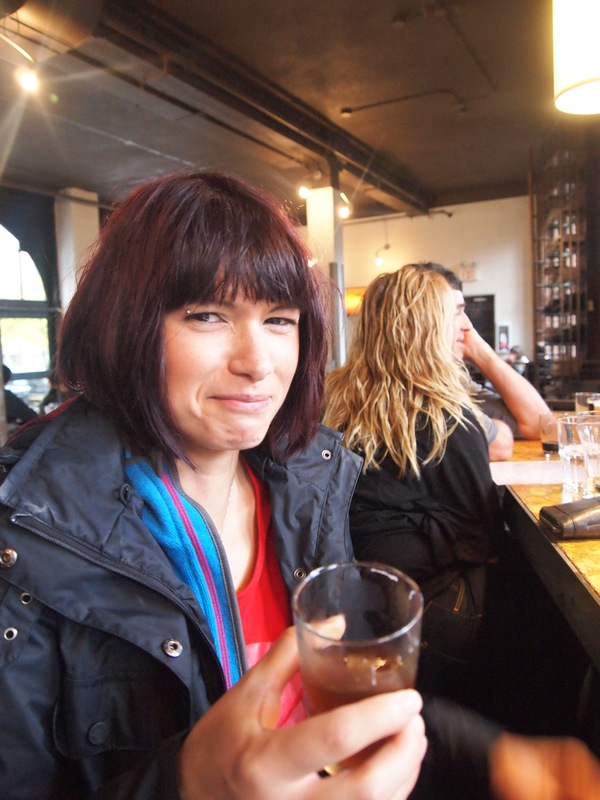 It really was just sour, sour sour, braying and snarling right on the edge of the vinegar abyss. After that little shocker, it was definitely a good time to go for the girliest-looking beer on the flight. The Unibroue Ephemere (5.5%ABV) Belgian ale with apple intrigued me because it’s apple, but it’s beer and not cider. It actually looked like cider with the same cloudy yellow which was sightly confusing. The aroma was more like candy and it tasted like candy too, but so fresh there was almost a touch of minty candy cane to start followed by gorgeously dry apple. It was almost alco-pop sweet but refreshingly well-done. I had been wondering about using apple in beer only a few days before but it would seem these Canadians got there before me! Where will your flight take you? The OH’s rather awesome parents had actually recommended the next beer which had impressed his mother on a previous trip to Canada. North Coast Old Rasputin Nitro Pour Imperial Stout (9%ABV).was a proper Irish style stout with a really big, tight, light tan head .It was so satisfyingly thick with real dark roasted malt aroma and flavour and a creamy lingering bitter cacao. A real rainy-day winter warmer of a stout. The final beer I picked for my flight was the JJ Bean Imperial Espresso Stout (7%ABV) by Conrad Gmoser (of Steamworks) which used coffee from a much-loved local chain. The gorgeous colour was black coffee but I was slightly suspicious since it appeared so thin and there was no head. However, even though there wasn’t the big mouth-feel of a lot of coffee stouts, the coffee aroma was knock-your-head-off strong and it tasted crisp enough to crunch. Clean, pure coffee bean with the tiniest touch of vanilla. What would your last beer be?